I followed the recipe exactly the only thing I don't have is a cookie press. I'm a very experienced baker and never had cookie dough go this wrong on me! I chilled the dough for 30 minutes before trying to roll it out but it was still very gooey and sticky. It also tore far too easily and my floured rolling pin couldn't even go one stretch before tearing it apart and getting the dough stuck to the *floured* surface. 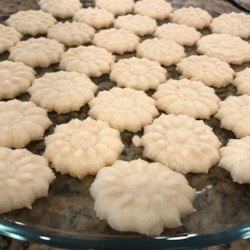 I'm sure this is a great recipe if you have a cookie press. The doug tastes delicious. I ended up pressing it out with my hands and using cutters. This obviously gives sort of ugly uneven cookies but with the amount of butter I used i didn't want it to go to waste. We'll see how they bake! Just a warning to other cookie press-less bakers. I was hugely disappointed. It's also kind of screwed up my Christmas party as I now only have 3 hours to finish off and offer ugly cookies! Haha.